Here we’re Introducing our extraordinary dream project “Zita”. A kind of theme every web designer want. 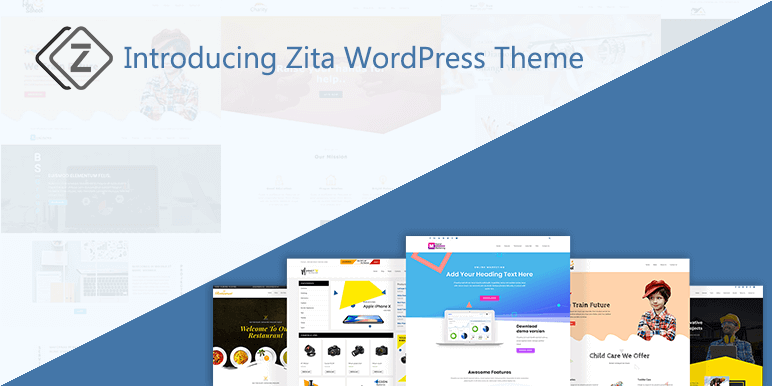 Zita is a unique, clean and user-friendly WordPress theme with a beautiful interface. You’re surely going to enjoy the pure magic of front-end editing experience and love building websites using it. Theme comes with lots of useful highly customize features and the possibility to create any website you want. Our team is fully dedicated to design a theme which is lightweight as well as easy to customize. Theme has live customizer in which each and everything will happen instantly right before your eyes. Certainly, it is one of the most powerful theme which can be effortlessly used with page builders. Along with Page builders, it is fully compatible with Woocommerce. Therefore, building an online website has become much easier with Zita. Lighting Fast – One of the most lightweight theme on WordPress. You can create a fast loading website and also improve the site ranking in the search engines. Made for Page builder – Theme is fully compatible with Page builders. Use any of your fav page builders with Zita and customize your site all on your own. Zero Coding Skills – If you don’t have any coding skills. No problem, it is completely feasible to design a website with Zita. You can design a site using Live customizer without adding any code. SEO optimized – Theme is SEO friendly so that search engine will love your site. It will make your site will be available online and also easily reachable. E-commerce Ready – Want to Sell product from your site! Zita + Woo will make a perfect online store site for you. Color & Typography – Free to use any Color for each element and choose amazing Typography in your site. Ready to use Pre-built websites- Fully Customized pre-built sites which helps you quick creation of your site. Just use them and simply give a final look to your own desired site. Header & Footer layouts – Awesome header & footer layouts with fully customizable options. This option provides you the opportunity to design an attractive site by showing useful site elements in header & footer. Zita is completely free for Now & Forever. Just download the theme and enjoy it for the lifetime. It will be available on WordPress.org shortly. After that, you can download it from there also. We keep updating our theme with customization options and will continuously release ready to import demos. We hope you’ll like Zita 😀 Download it from Here. Zita vs OceanWP vs Astra : Best theme for builders ?